Read to Succeed on our Rugs For Classrooms! 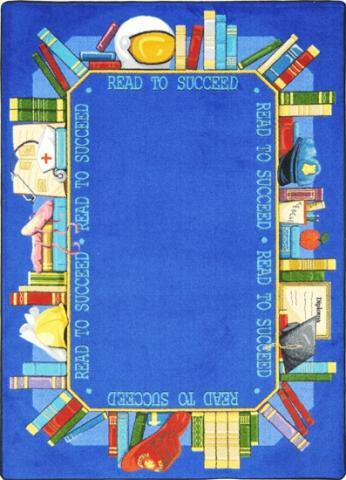 You will captivate your students during reading time if they have a soft, comfortable rug to sit on. We make the Rugs for Classrooms with our proprietary SoftFlex®, which is an air-texturized, polypropylene secondary back that is the latest advancement in area rug backing systems. Tightly woven nylon fibers provide firm, yet inviting support, while eliminating the wrinkles that rambunctious children create during reading time. Our anti-soil and anti-stain treatment makes cleaning the Rugs for Classrooms a cinch. All you need is a damp cloth to eliminate stains and one swipe of a vacuum to pick up dirt clods. In addition to our superior functionality, we designed the Rugs for Classrooms to encourage your students to interact during reading time. A wide assortment of colorful classroom artifacts, including myriad books, form the border of this artistically designed rug. The positive message of "Read to Succeed" reminds your young students about the importance of reading. Your students will look forward to reading time from their sitting positions on the Rugs for Classrooms.